Trevor Phillips, the former chair of the Equality and Human Rights Commission, was among the experts who took part in a 'Cultural Literacy' event organised by Professor Dana Arnold from the Centre for Ideas (CfI) at Middlesex University. Also on the panel at BBC Broadcasting House in central London was the BBC's Head of Religion and Ethics Professor Aaqil Ahmed (second from right), journalist and broadcaster Yasmin Alibhai-Brown (second from left), and Dean of the School of Law and Chair of the CfI Professor Joshua Castellino (right). In a keynote address, Mr Phillips said the ongoing migrant crisis in Europe meant the concept of cultural literacy is more relevant than ever. "We have seen what's happening at Europe's margins in the Mediterranean," he said. "We are at the beginning of a huge movement of the human population across the globe. "The questions we face now are small by comparison with those of what we are about to face." Later, during a four-way panel debate, Professor Castellino talked about the importance of students having a grasp of these issues and the responsibility of universities to instil strong values in their graduates. "Student success depends on their cultural literacy," he said. "Educational success is students graduating with an ability to speak truth to power." 'Cultural Literacy' was part of an ongoing series of events organised by the CfI, which are designed to inform the debate around issues that have urgent implications beyond higher education as well as within it. 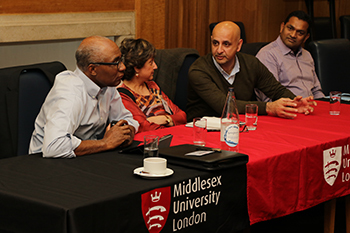 In 2016, it will host a major conference on diversity at Middlesex University's London campus.